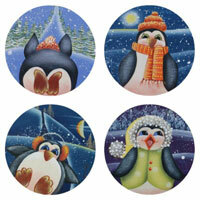 Winter Christmas packets for the decorative painter. Just in time for Christmas. As a decoration for yourself, or as a gift, this project is designed to please you. 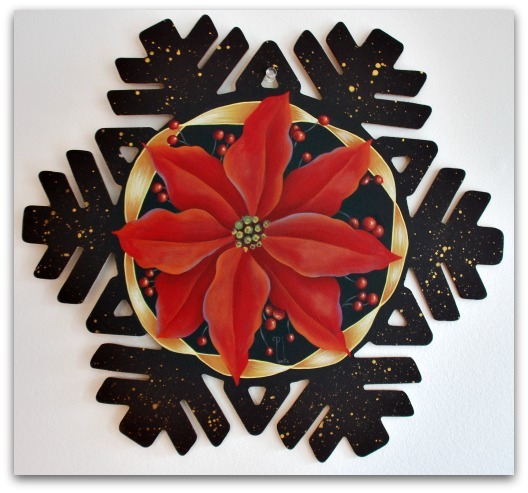 This large poinsettia is painted on a 14-inch round snowflake MDF surface. The painting area is about 8-inches in diameter. Similar surfaces can be purchased through Cupboard Distributing, Viking Woodcrafts or other craft stores. You could paint this design on any surface at all. 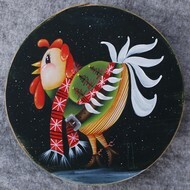 Perhaps a lazy Susan, a round bentwood box or a round tray or a platter. For a quick project, I know you'll really enjoy painting this one! Packet includes line drawing, shading diagram and 5 detailed photos. Such a joyous quartet of penguins! Paint these 4 coasters or ornaments in no time at all! They make a great gift and they're so much fun to paint!! 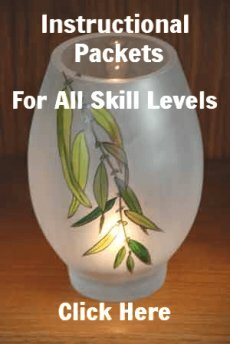 This pattern packet has 21 pages with 24 detailed step-by-step images and detailed instructions. A complete materials list is provided as well as a line drawing. Many of us remember being in snowball fights as kids. 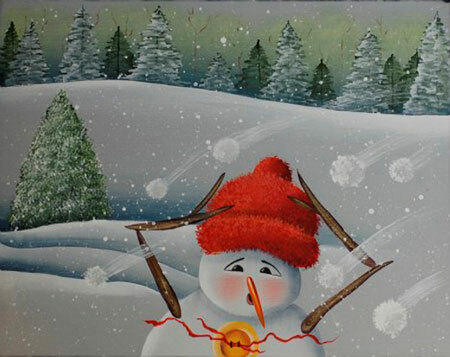 This little fellow is surrounded by trees and snow and enjoying a fun filled, friendly snowball fight with friends. This pattern packet has 22 pages with 30 detailed step-by-step images and detailed instructions. A complete materials list is provided as well as a line drawing. This packet is ready for immediate download. Suitable for a Beginner+ skill level. 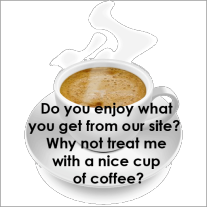 You can pay using PayPal or any major Credit Card. This is a fun, easy and very pretty design to paint. 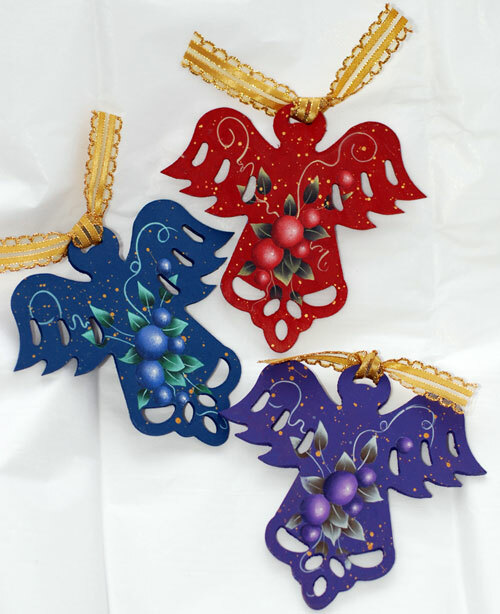 Besides the angel cut outs, you could use the berry pattern on other small ornaments. Have fun with it and try other color combinations for even more variety! 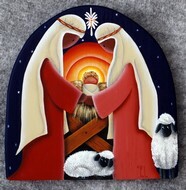 This project was featured in a Special Holiday Issue of PaintWorks in 2012. This pattern packet has 9 pages with 1 large detailed image, a step-by-step color worksheet and detailed instructions. A complete materials list is provided as well as a line drawing. This pattern packet has 11 pages with 1 image and detailed instructions. A complete materials list is provided as well as a detailed line drawing, a shading diagram and a color worksheet. Click Image above to download immediately. I think snowmen are adorable. I had fun with this little fellow and his fine-feathered friends. Imagine painting a set of champagne flutes or wine glasses to give as a gift. Can you just see the look on the recipient’s face? Or paint some for yourself! They’re whimsical and sweet and work up in a really hurry. Perfect to sell at a fundraiser too. And once they’re baked, they’re dishwasher safe! And so I bring you this really easy, super fast project suitable for beginners and up! This pattern packet has 10 pages with 2 images and detailed instructions. A complete materials list is provided as well as a detailed line drawing in 2 sizes and a color worksheet. 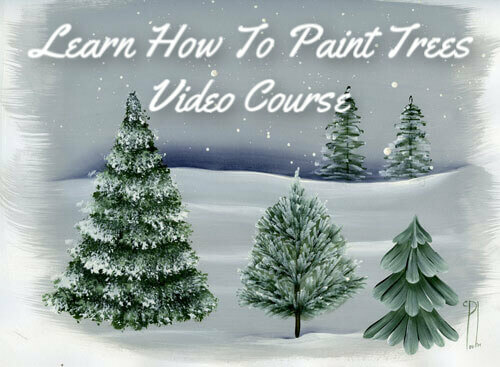 This delightful design featuring pinecones and boughs works up very quickly and can be achieved by a beginner painter! 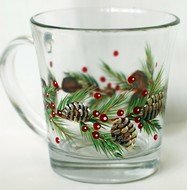 Purchase glass mugs or wine glasses from a discount store and whip up a set as a very affordable gift! I’ve used Americana Gloss Enamels for this project. Once cured, the glass mugs are dishwasher safe, yeah! This pattern packet has 11 pages with 3 images and detailed instructions. A complete materials list is provided as well as a detailed line drawing and color worksheet. Suitable for a Beginner skill level. I designed this packet to give you beautiful results, allowing you to enjoy the serenity of Christmas. The blues and greys bring you a feeling of peace and quiet, while the addition of metallic paints adds a touch of elegance to this simple and charming plaque. This project will fit a plaque approximately 16” X 7.5”. I have even included instructions on where to purchase it so you don’t have to waste time shopping around. Truth is, any surface of that size will do, so you’re free to paint this in whatever way pleases you. To ensure you get great results, I used DecoArt acrylic paints because they are fun to use, are quite affordable and are so easy to find. I know you will agree that painting should be fun and relaxing. This little funky chicken is dressed for a chilly winter evening. I think he likes his new wardrobe because he’s really strutting his stuff! I hope this design will add a little joyful ray of sunshine to your home all winter long. Designed to give you great results, this project is adaptable to any surface, so you are not restricted and don’t have to wait to find a surface to paint on. For this project I used DecoArt acrylic paints because they provide great results at an affordable price and they are so easy to find. To make sure you get every detail, this pattern packet has 11 pages with 5 images to support the detailed step-by-step instructions. There is absolutely no guesswork involved so no confusion for you. You will be able to paint this piece because everything you need is here. I leave nothing to chance. I include a complete materials list to remove any chance of you not having what you need to complete this project, because I know just how frustrating that can be. And the last thing I want is for you to be frustrated. 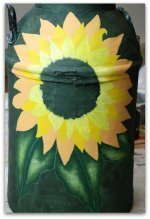 For this project I used DecoArt acrylic paints. The surface is a tin Pear which is available from Della and Company. The packet includes a link to their site. 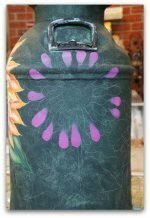 Find more pattern packets at the Tole Painting Pattern Guide. Go from Packets by Cheryl Poulin to our Home page.